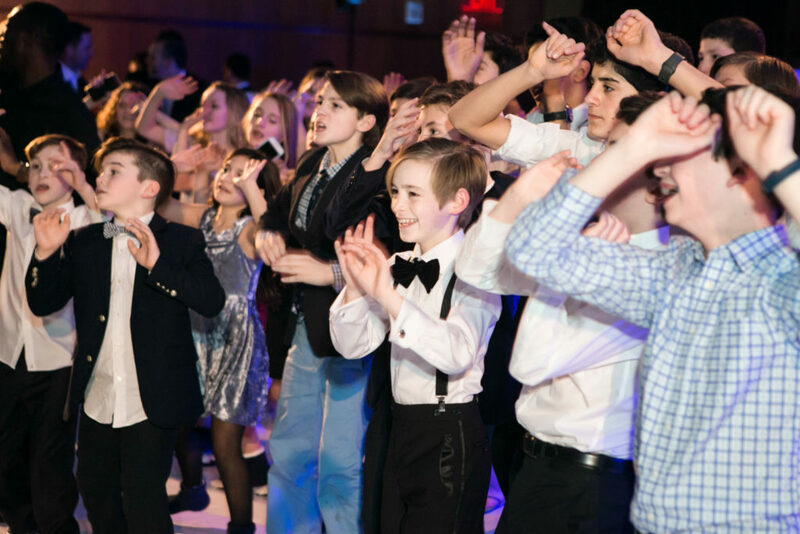 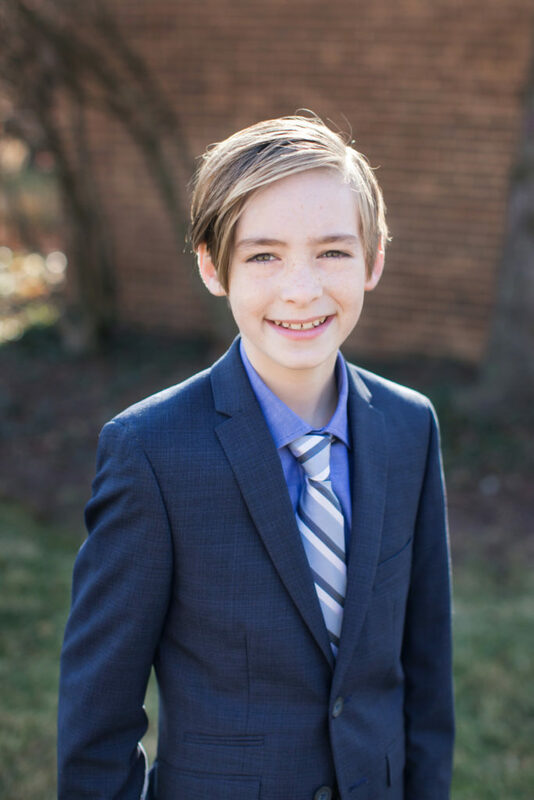 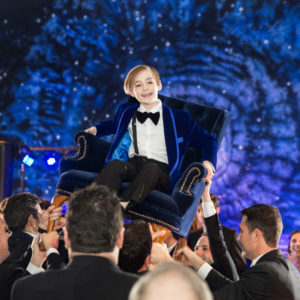 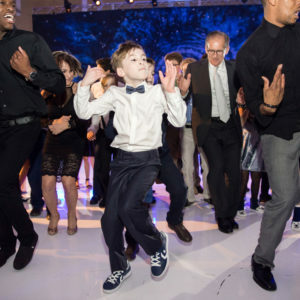 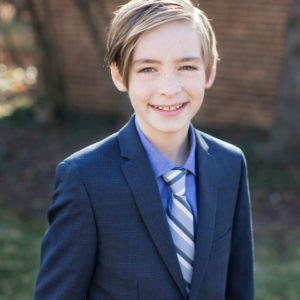 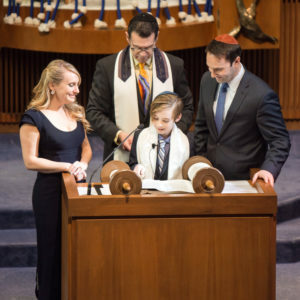 I can’t believe it has been a few months since my son Joseph’s Bar Mitzvah. 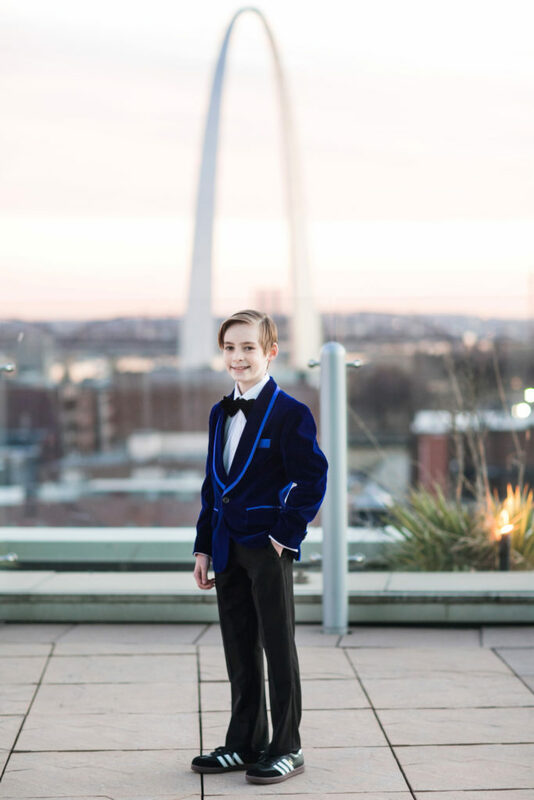 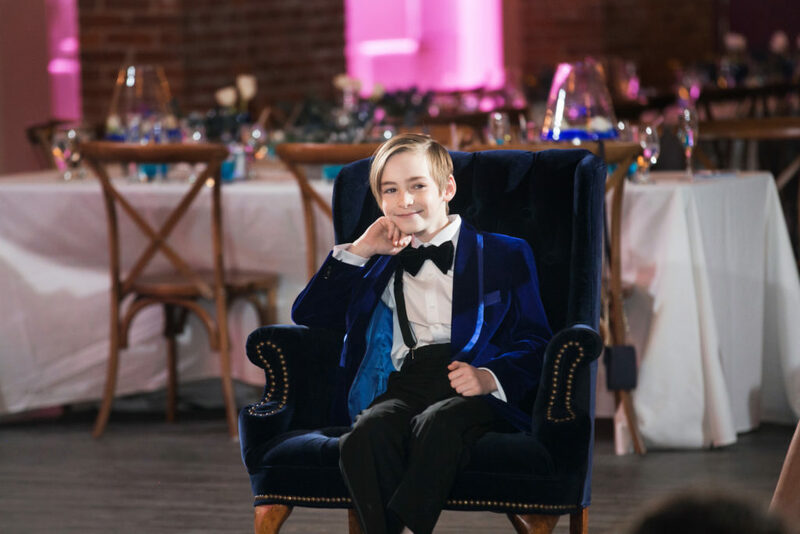 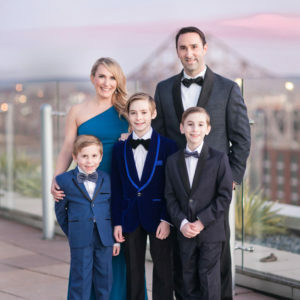 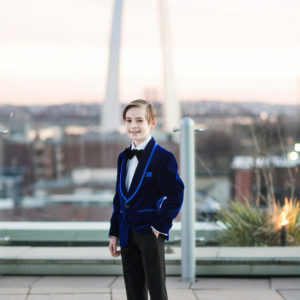 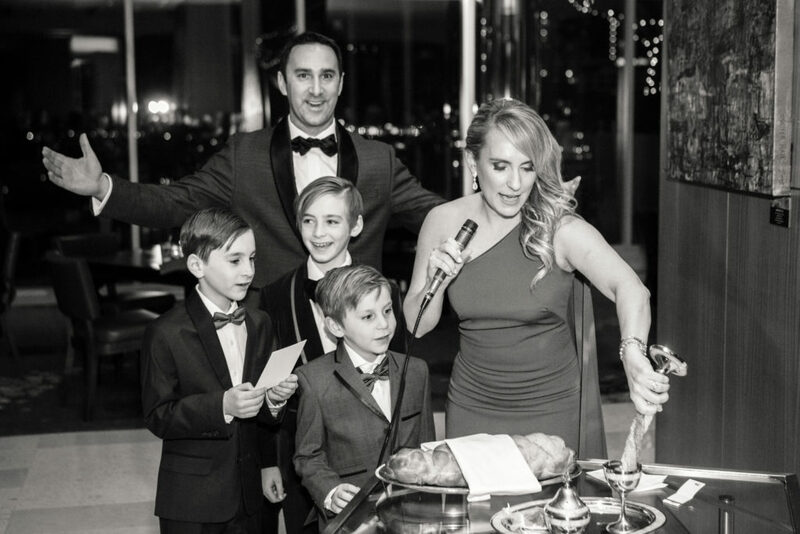 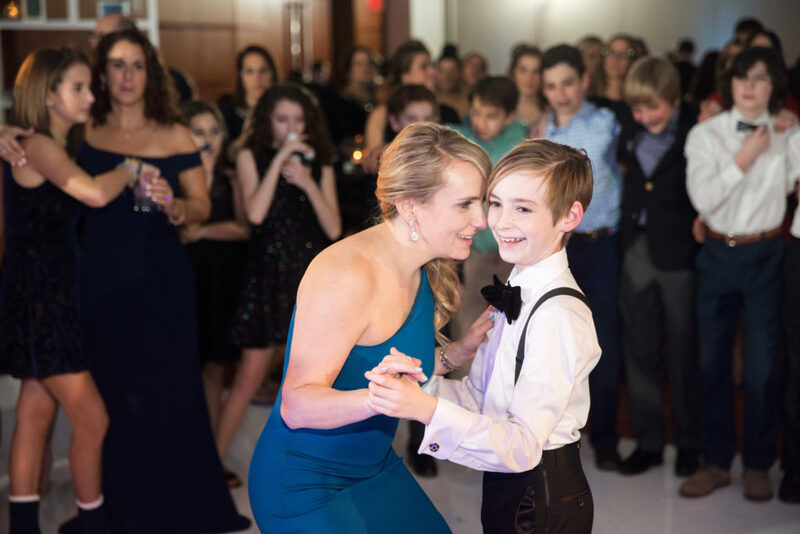 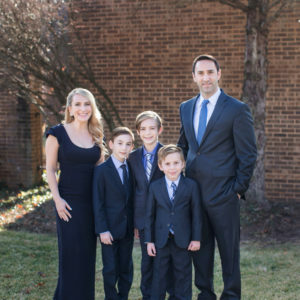 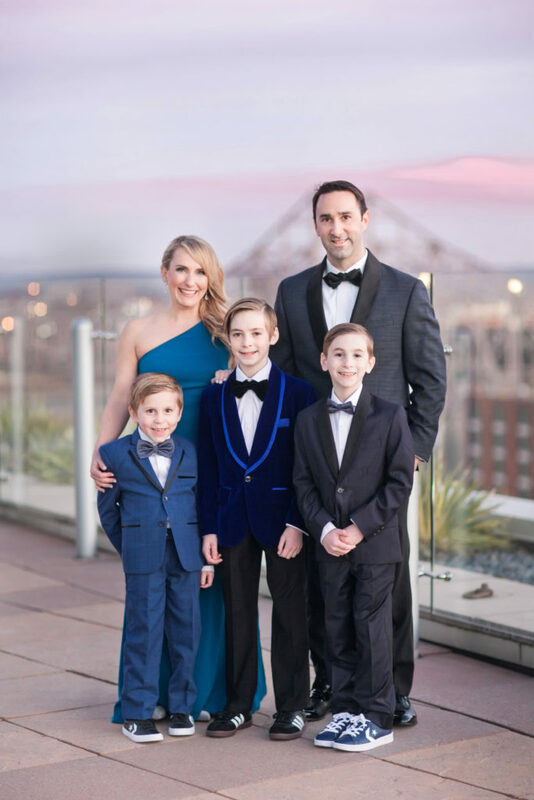 In the months leading up to it, I experienced an array of emotions and anticipation as my roles of event planner and mom collided. 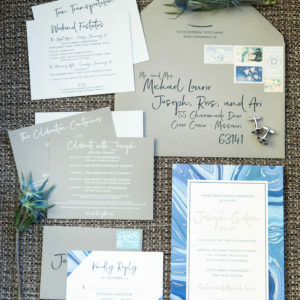 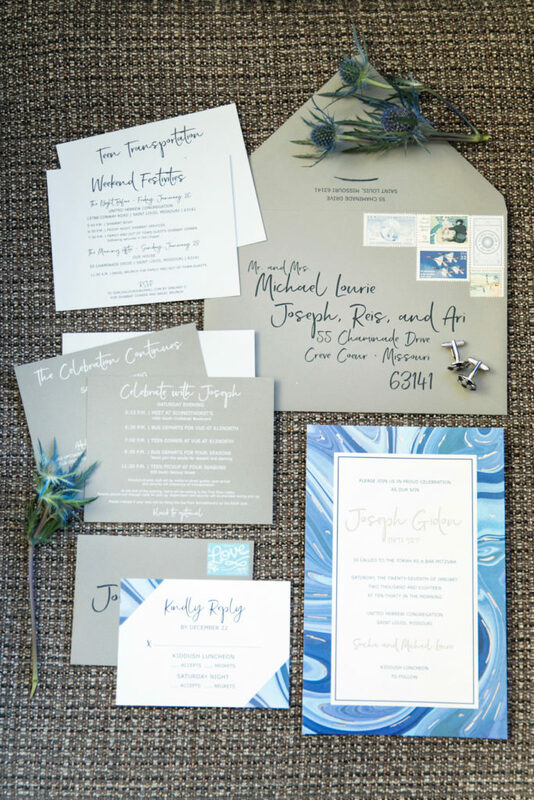 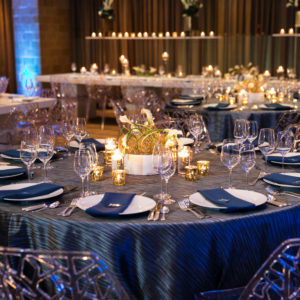 As a planner, I’m always creating events that capture my clients’ visions in a way that is uniquely them. 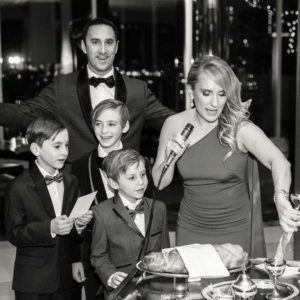 So I applied the same approach and knew I wanted to share an experience full of LOVE and energy with all our family and friends. 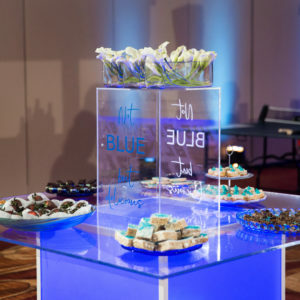 As ideas for pieces of the event came to life, I wanted to create many distinct elements and memorable moments that seamlessly worked together. 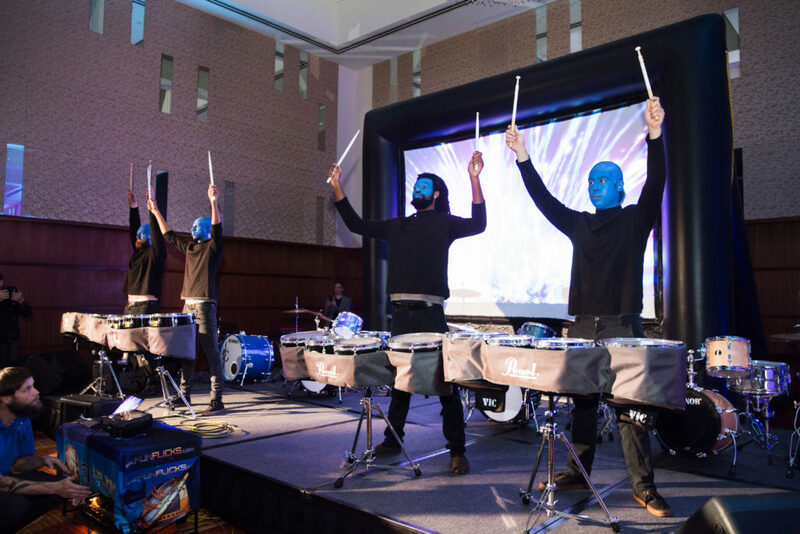 The collective experience was more important than any particular part. 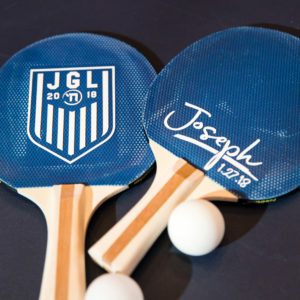 That’s how I feel about Joseph. 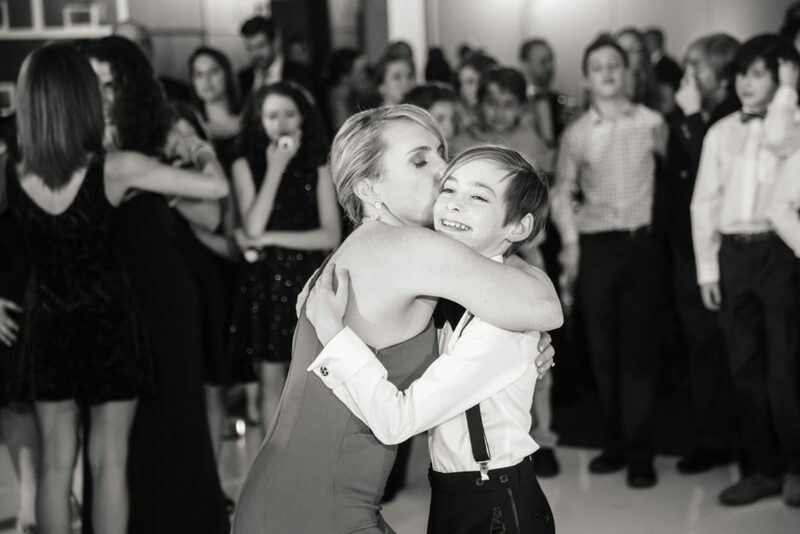 There are so many wonderful little things that make him … him. 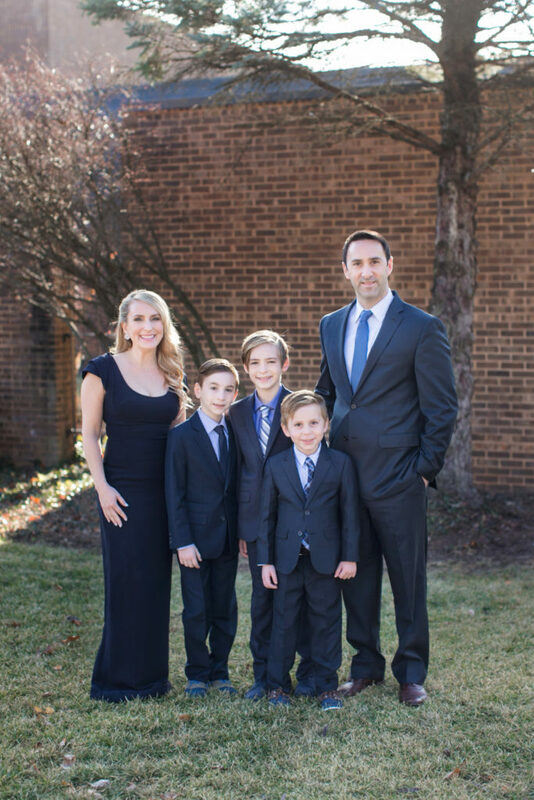 I can’t name one that is more important than another. 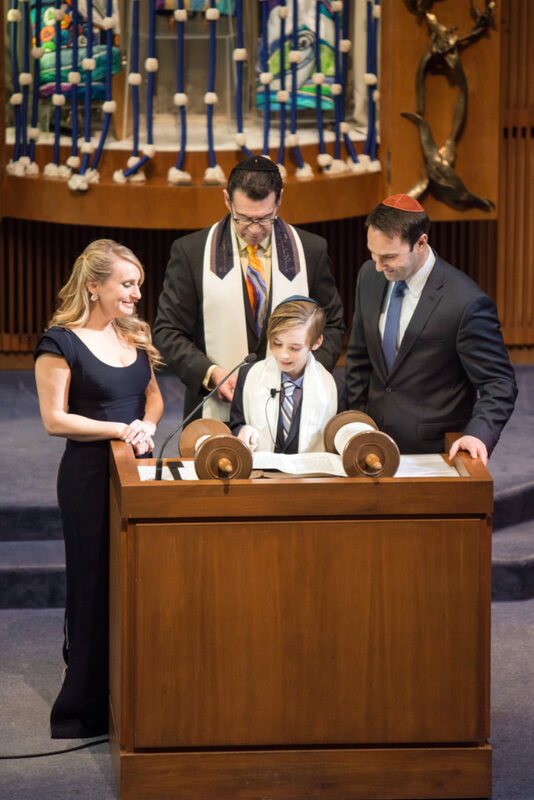 I am so proud to share some photos from one of the most memorable days of our family’s life. 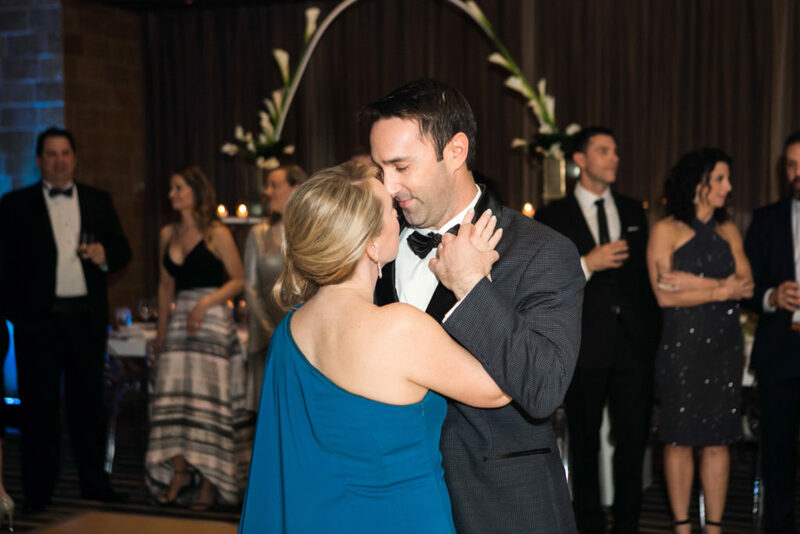 Hopefully you’ll enjoy looking back with me at all the little details that went into creating this incredible celebratory milestone. 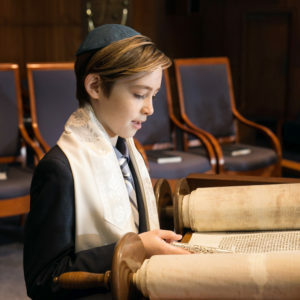 The word that best describes Joseph’s Torah service was warm. 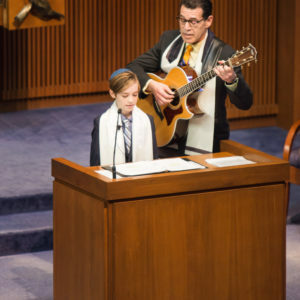 He melted our hearts by beautifully leading the congregation in worship. 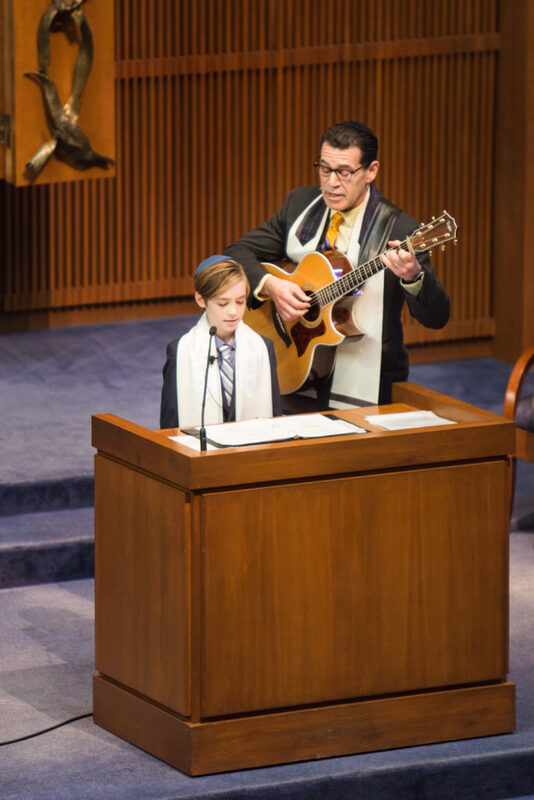 It was an emotional morning, as this moment we had envisioned for many years was finally here, and everyone beamed with pride as he received the Torah from the generations before him, sang L’Dor V’Dor with the Cantor, spoke from the heart, and chanted Hebrew with poise and pride. 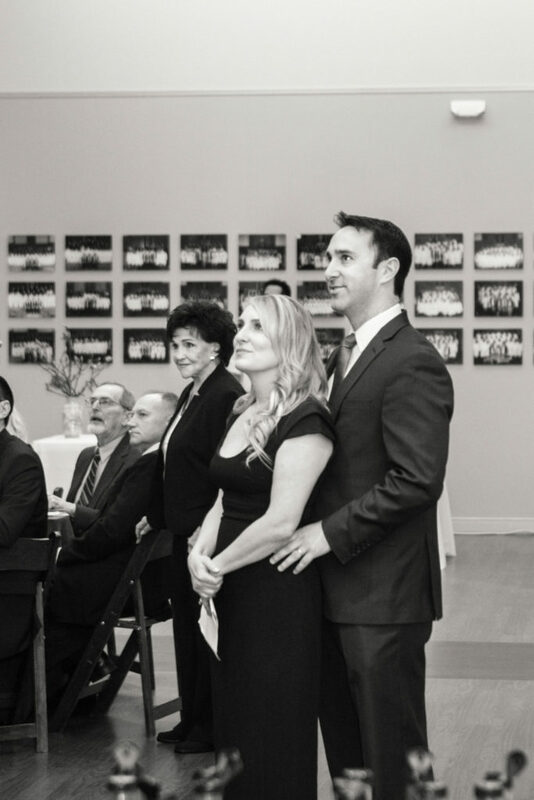 The service was absolutely the highlight of the weekend for Michael and me. 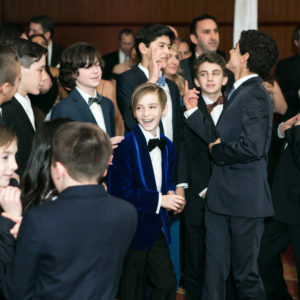 We were just so proud. 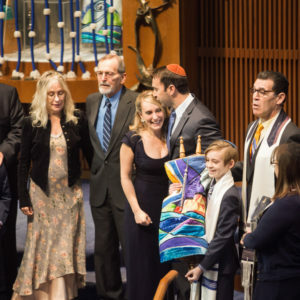 My favorite part: Watching him as he received the parent blessings we gave him and experiencing the clergy bestow upon him the holy blessings of becoming a Bar Mitzvah. 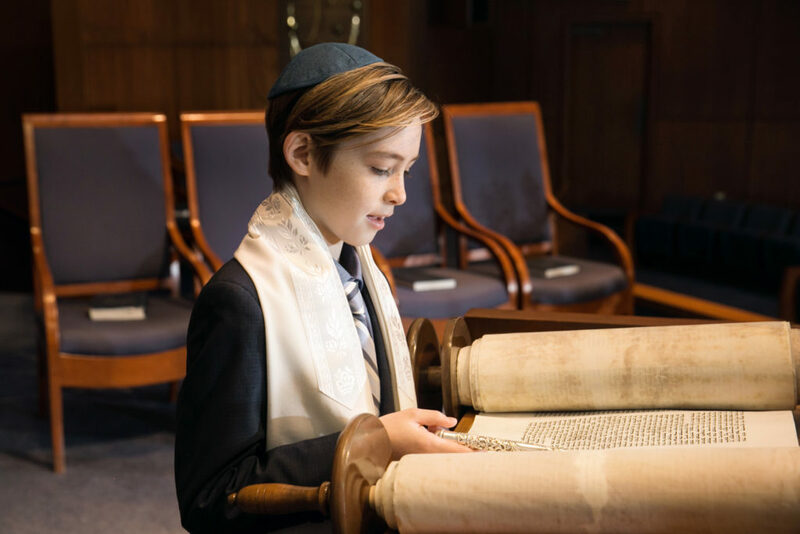 Following the morning Torah service, Joseph was showered with candy as he went to greet family and friends in the Kiddush Luncheon. 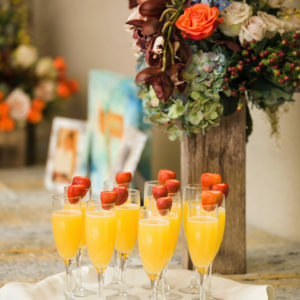 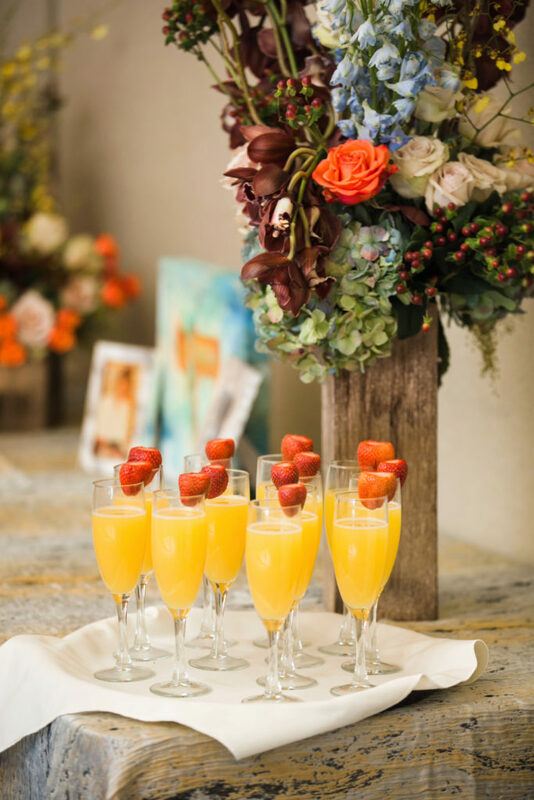 Guests enjoyed Sugarfire BBQ, freshly made mini donuts, hot cocoa, mimosas and Bloody Marys, as sounds of a live acoustic guitar filled the room. 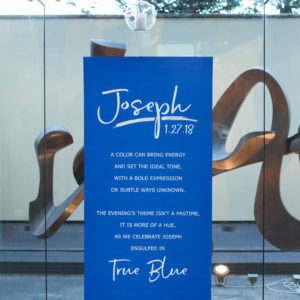 My favorite part: Enjoying everyone’s reactions to the creative montage that Michael created in honor of Joseph. 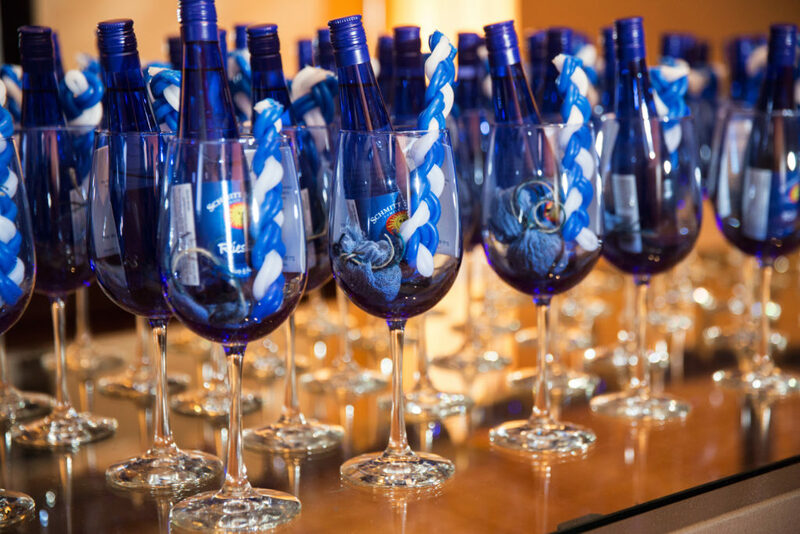 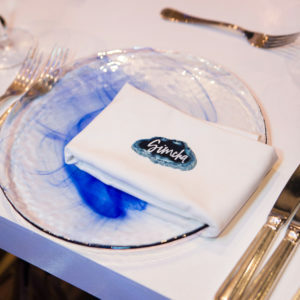 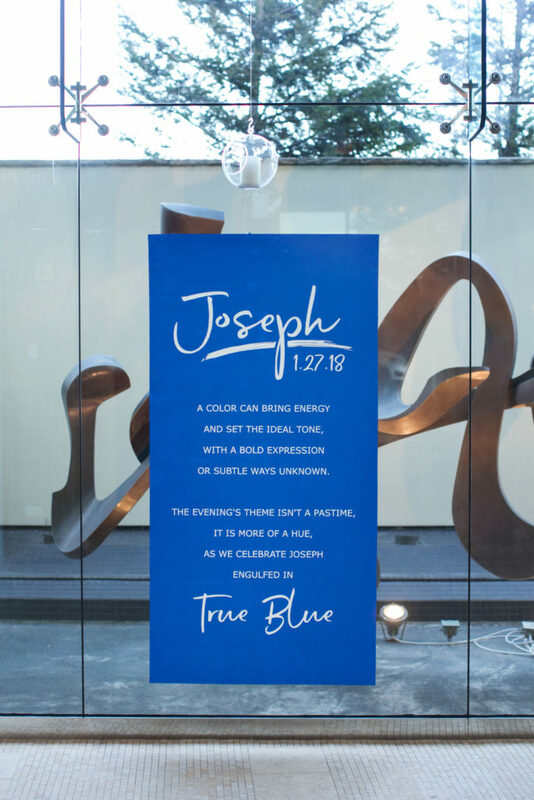 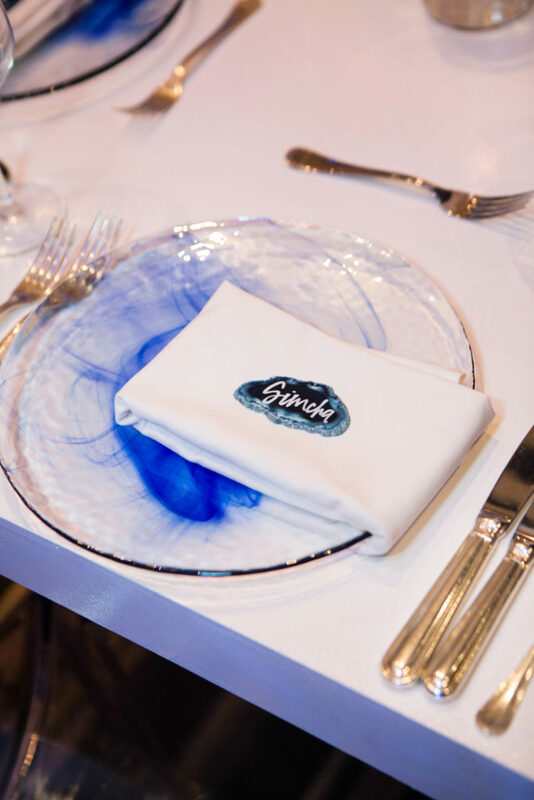 As guests arrived to the Four Seasons, they had the first glimpse of the theme for the evening: True Blue. 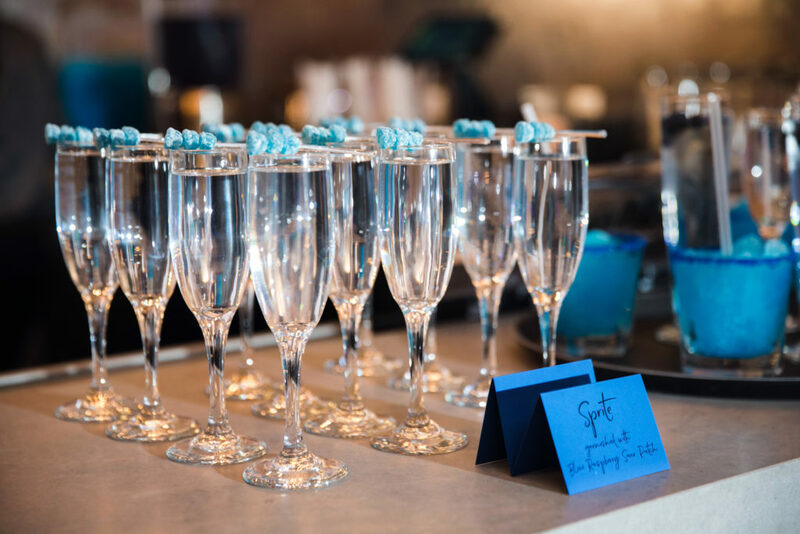 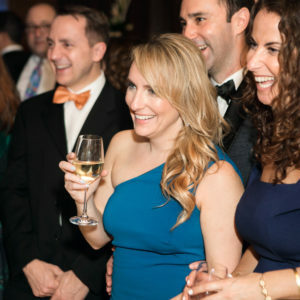 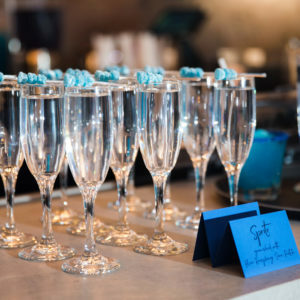 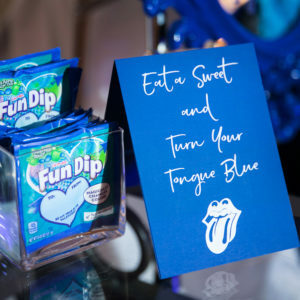 During cocktail hour, they were greeted with glasses of Blanc de BLUE Champagne and impressive culinary Hors d’oeuvres bites that had a BLUE twist to presentation and taste. 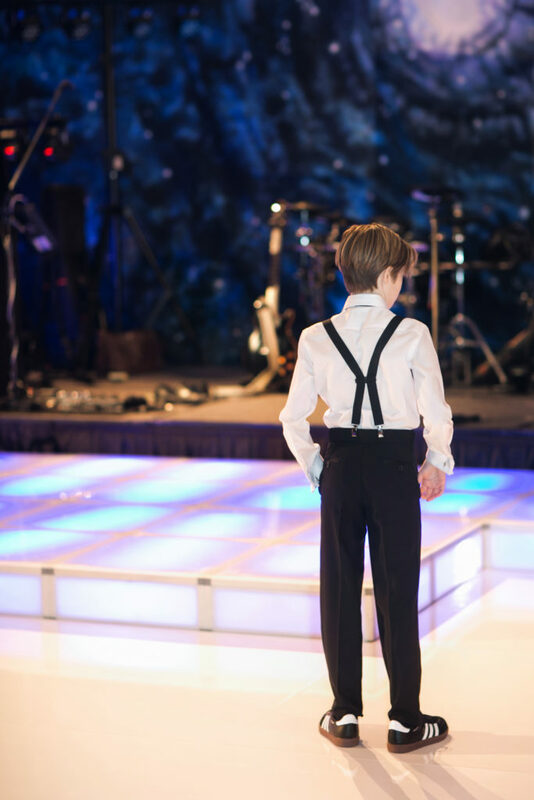 Joseph and our family greeted and chatted with guests as we listened to the sounds of a BLUEgrass duo. 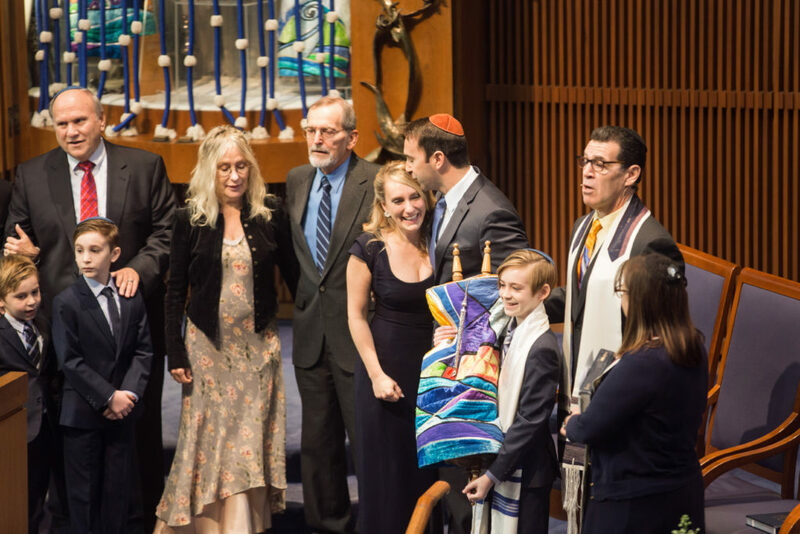 My favorite part: Our family leading the blessings and a quick Havdallah service to mark the end of Shabbat and the beginning of the evening celebration. 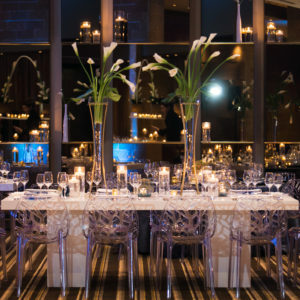 The teens had a private reception and dinner at 612 North Venue, which is right down the street from the Four Seasons. 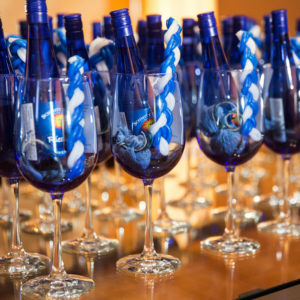 Joseph’s friends sipped on BLUE mocktails and partied with Utopia Entertainment. 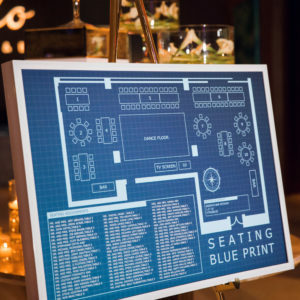 Adults entered the dinner reception and found their seats by way of BLUEprint seating chart. 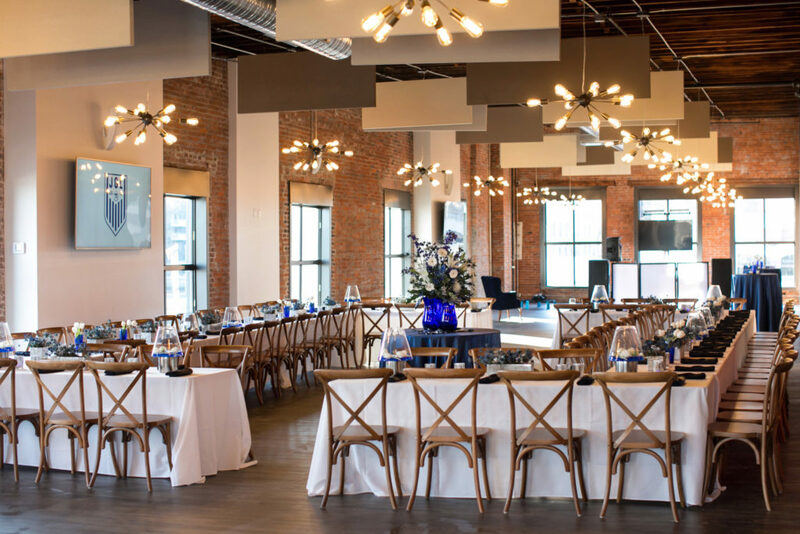 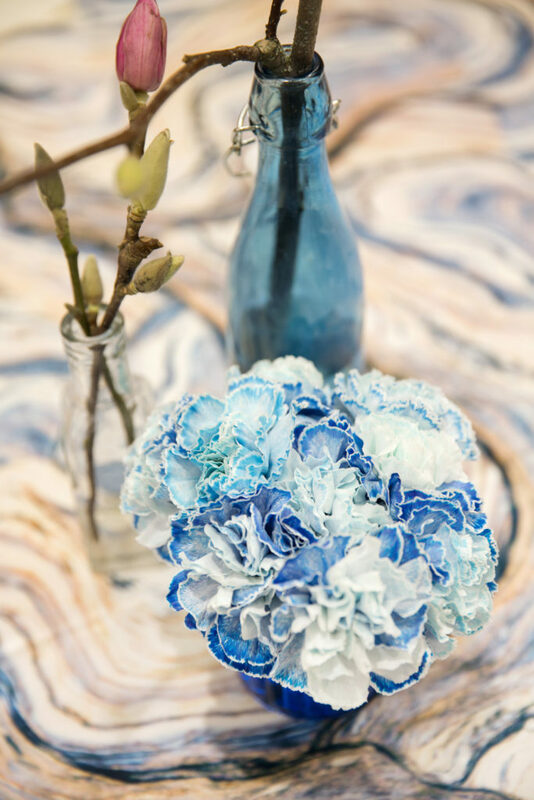 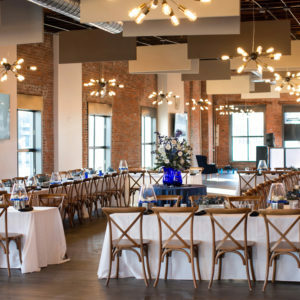 The room was a beautiful combination of BLUE and white accents and florals. 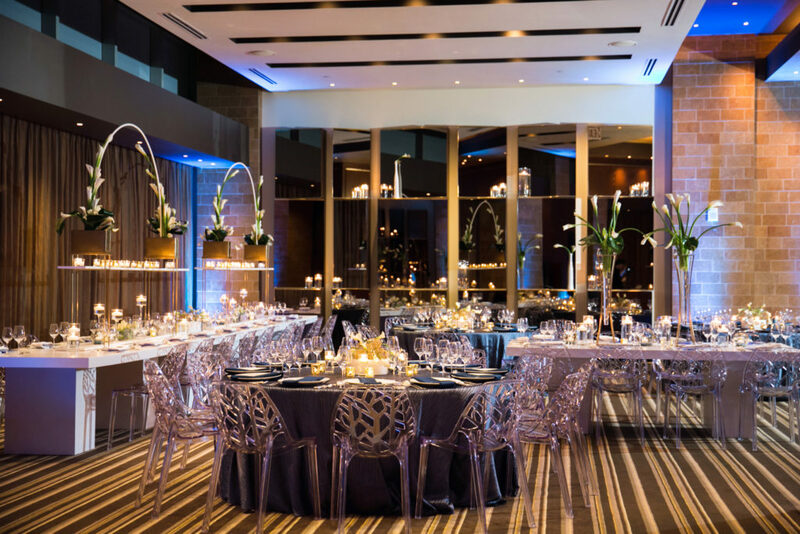 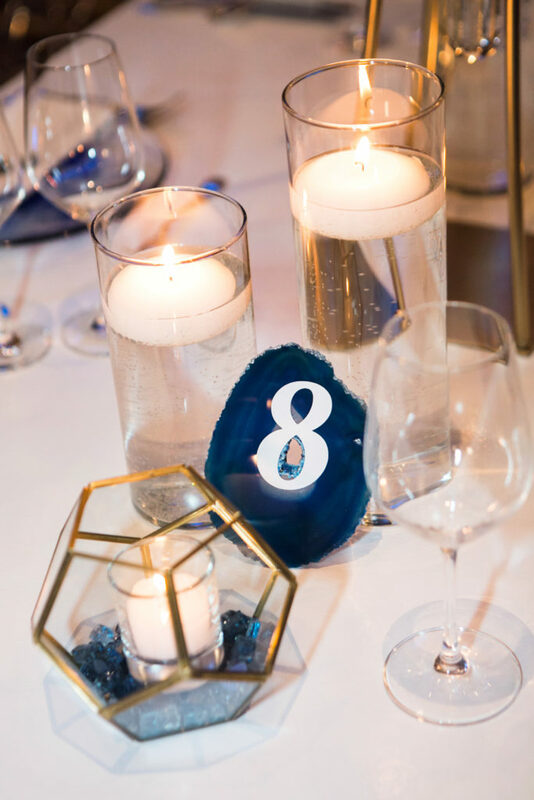 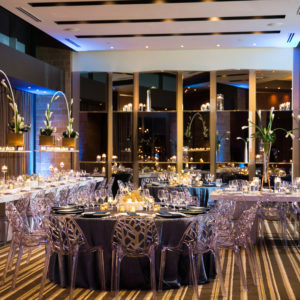 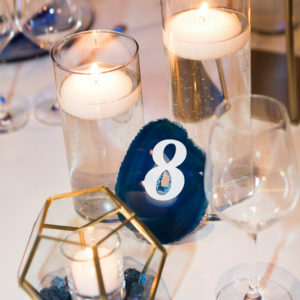 Belli Fiori created breathtaking tabletop décor, soft BLUE uplights, and warm candle light, which was combined with the use of BLUE agate rock, and glass. 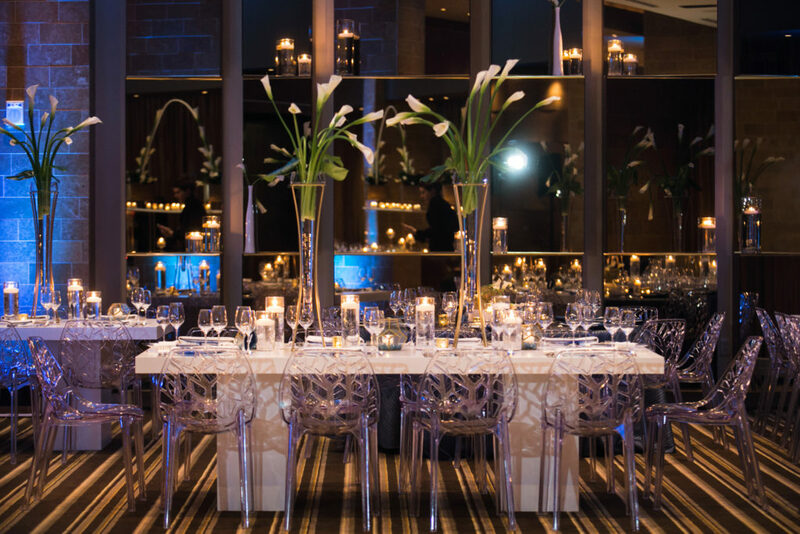 The mod tables and chairs from Exclusive Events helped to capture the perfect mood and aesthetic that I wanted to create for adult dinning. 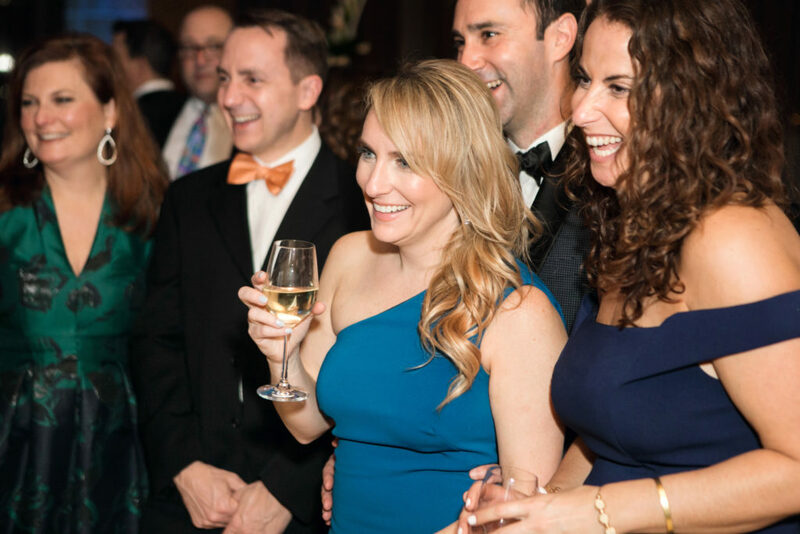 We laughed, we dined and just enjoyed each other’s company. 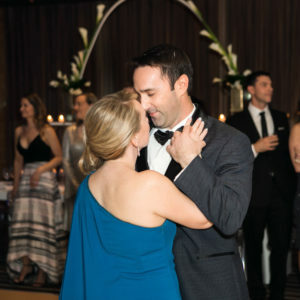 My favorite part: Slow dancing with Michael during the adult dance set in between courses. 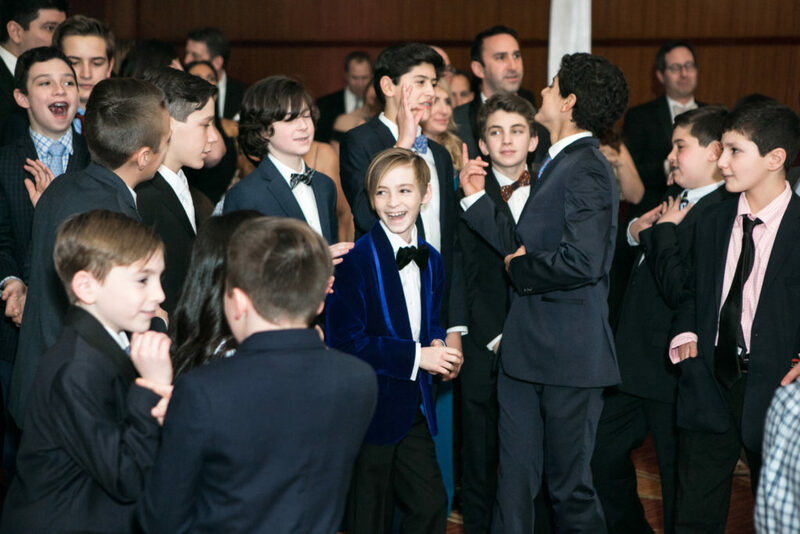 The teens settled into their dinner. 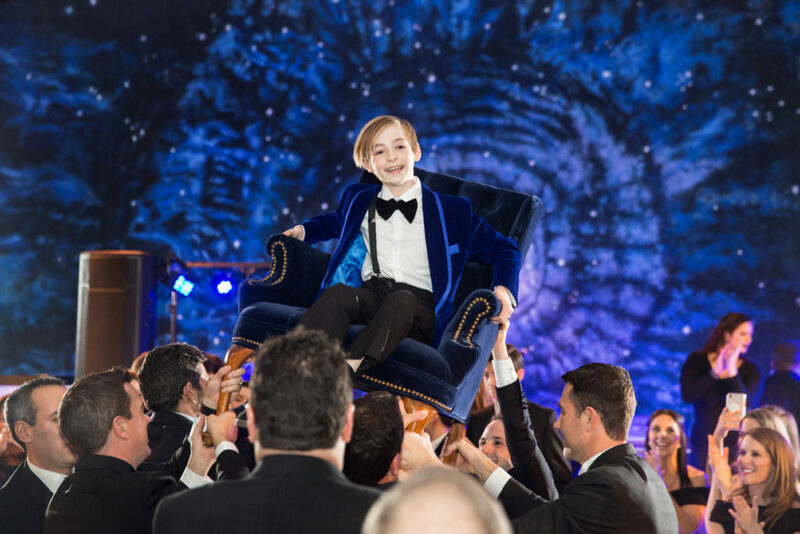 Joseph’s favorite food is stir fry and everyone enjoyed a sushi first course, with custom BLUE fortune cookies, followed by some of Joseph’s favorites from restaurant Drunken Fish. 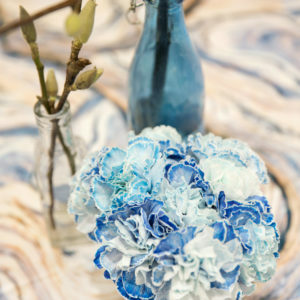 Teens sat in a large square configuration with cool BLUE tabletop décor by Thorn Floral. 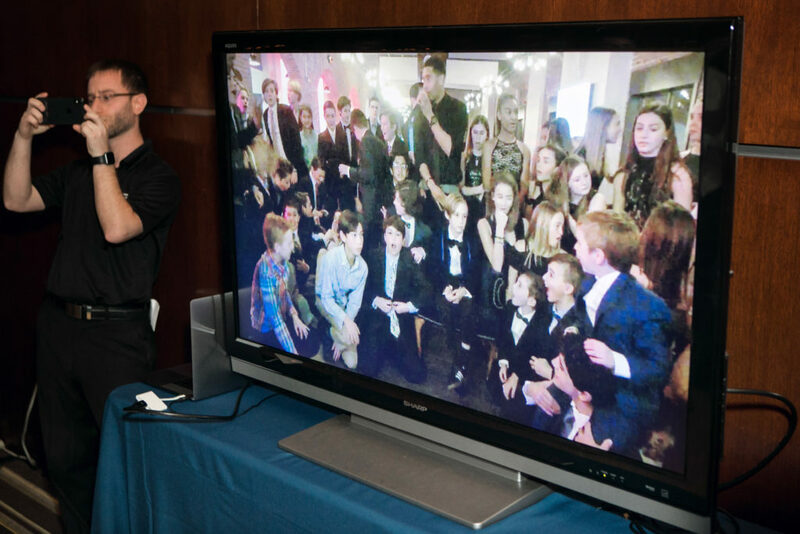 Teens were unaware that adults had spying privileges through livestream of what was happening at the teen dinner. 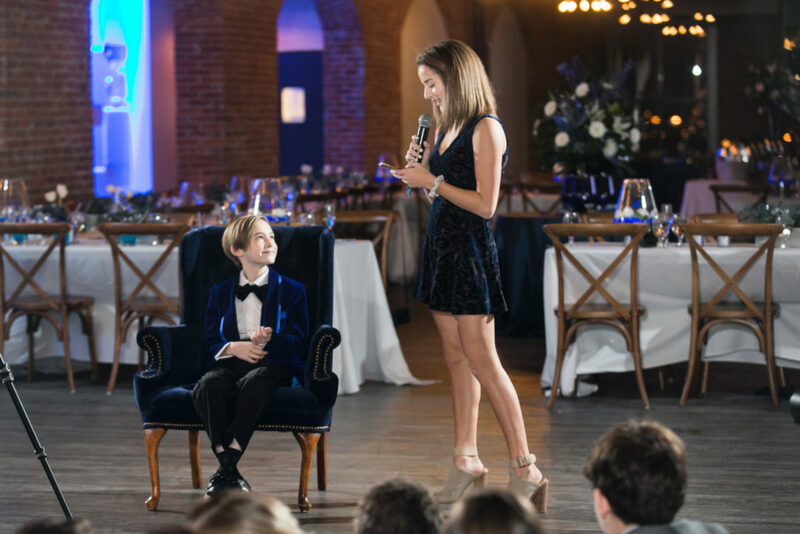 This created an opportunity for the adults to listen to the teen toasts that Joseph’s friends and brothers gave in his honor. 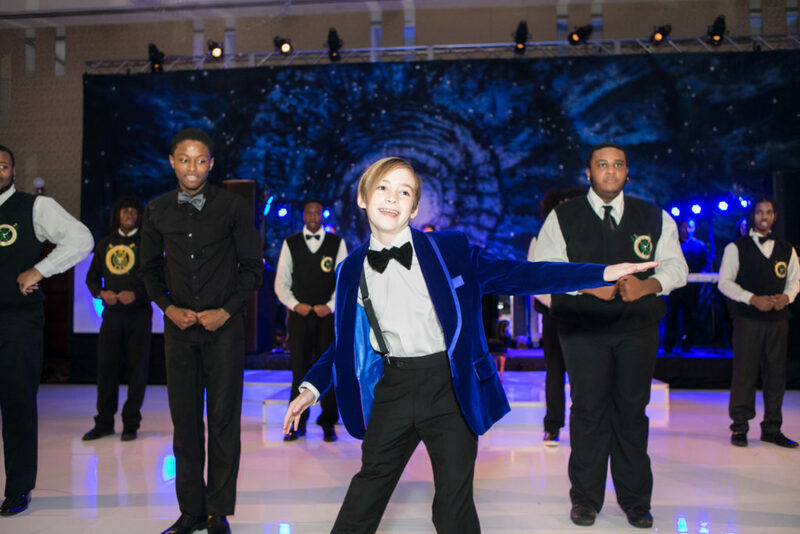 Teens were transported over to the Four Seasons while adult guests made their way to the ballroom. 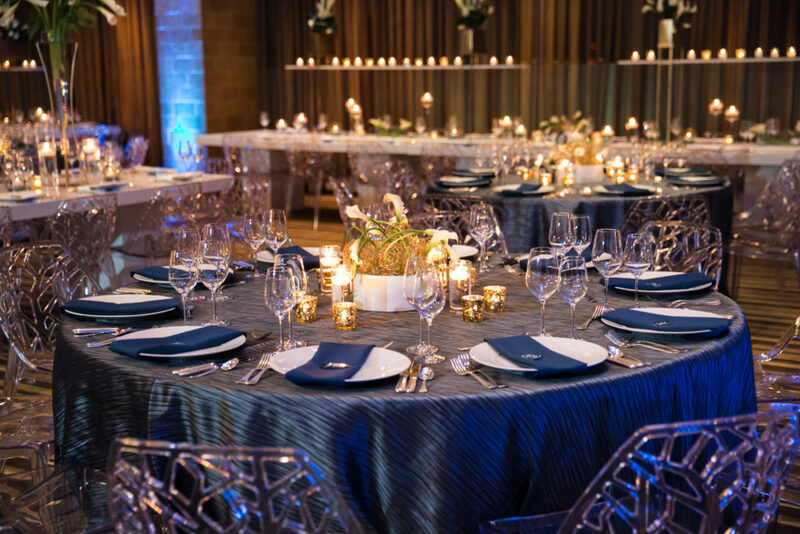 Together, all guests entered a section of the ballroom. 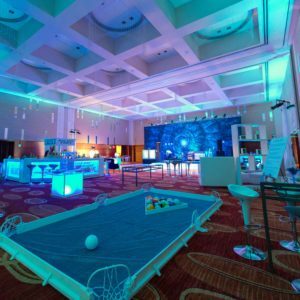 It was like entering a concert space, as a large screen projected Just Dance videos, serving as a backdrop to a stage that was clearly set for something to come. 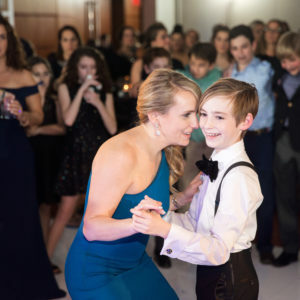 Our family loves playing Just Dance, so it was fun to see guests following the choreography for “I’m BLUE (Da Ba Dee)” and the BLUE’s Brothers “Everybody Needs Somebody” (which had clips of Joseph, Reis and Ari dancing to the same song years ago). 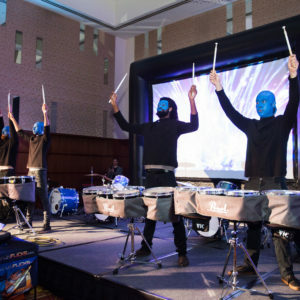 Then suddenly the music, lighting and sound transitioned, as a BLUE Man drumline took the stage, performing in front of video images synced to the percussion performance. 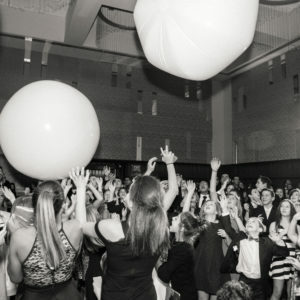 My favorite part: Seeing people engulfed in the concert experience as massive glowing BLUE air balloons were released on the crowd. 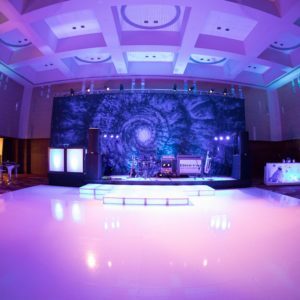 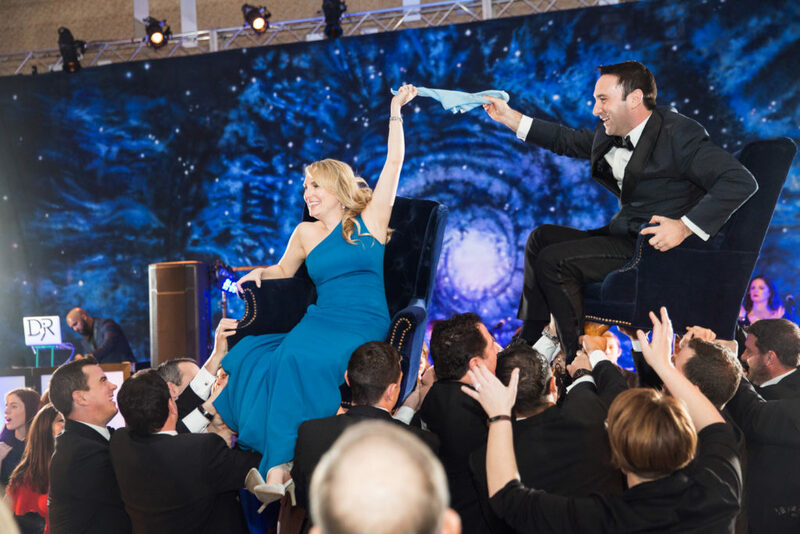 The energy was high, and just as the performance ended, the airwall that separated the rock concert section from the rest of the ballroom opened up to reveal the dance floor and entertainment. 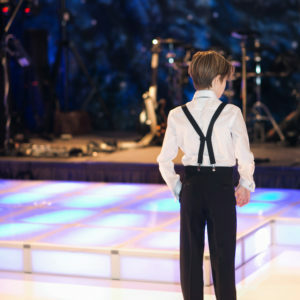 I digress from the party for a moment as I walk you though the ballroom setup and theme dynamics. 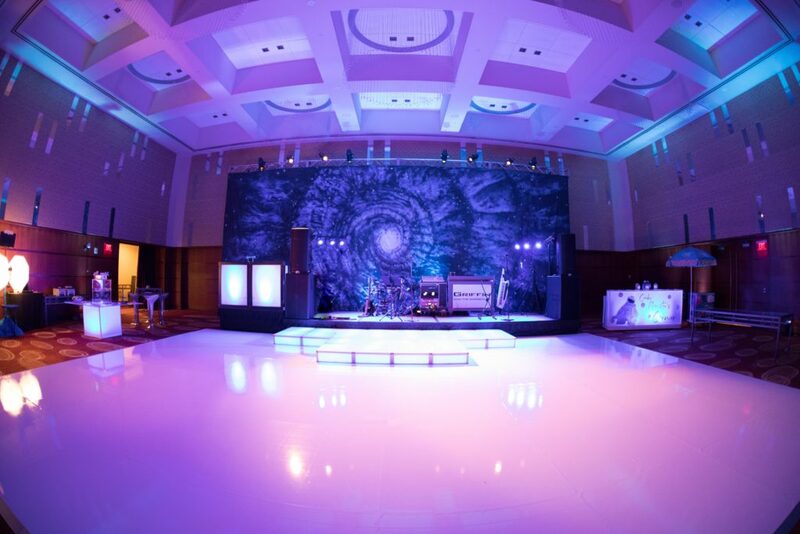 A multi-leveled dance floor, featuring blue t-shape light up sections cut into the dance floor, with an elevated stage for the band and the DJ combination. 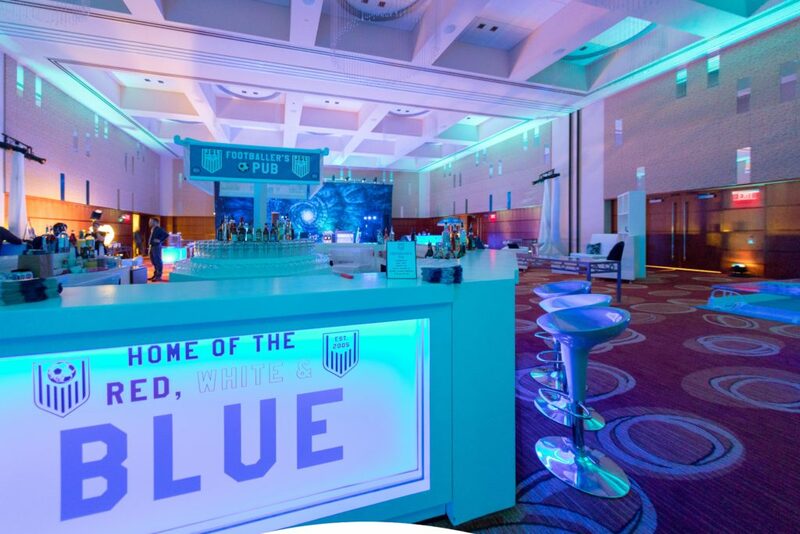 A four-sided bar featured a custom theme on each side, depicted by the panel design and complemented by the beverage menu and bartenders’ attire. 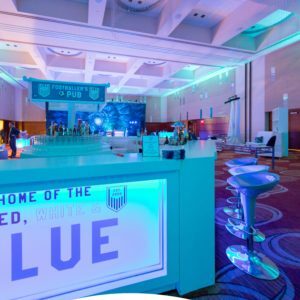 Joseph loves soccer, so a pub-style beer bar served as one side. 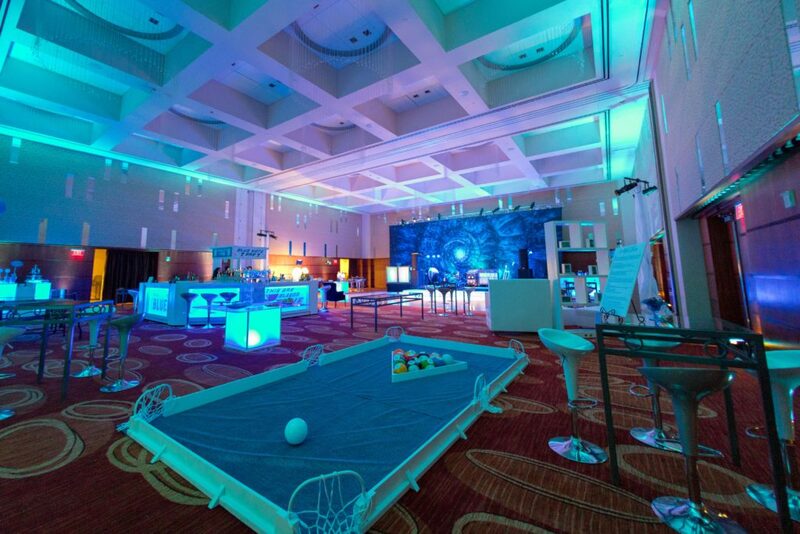 Along with the soccer bar panel, a snook ball set (soccer pool) was custom built with BLUE fabric. 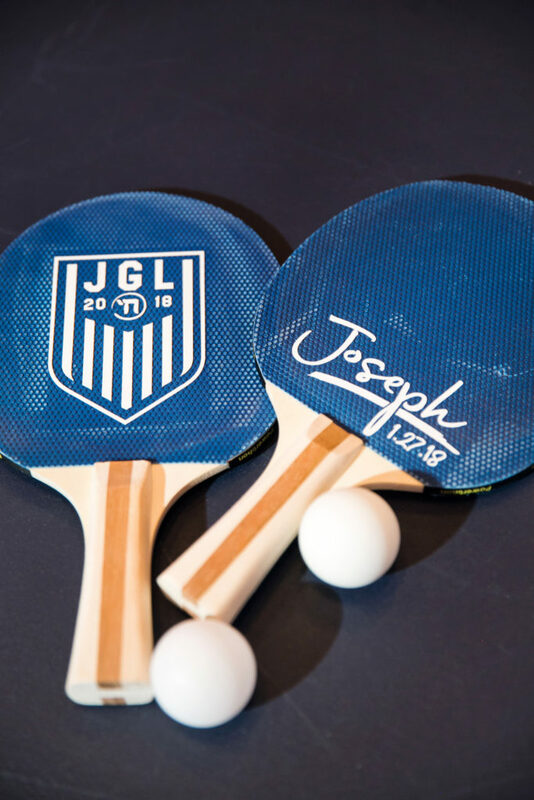 He also loves ping pong so we had BLUE table set out for guests to play. 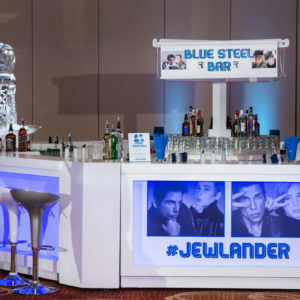 The BLUE Steel (Zoolander) side of the bar served the teens with drinks created just for them. 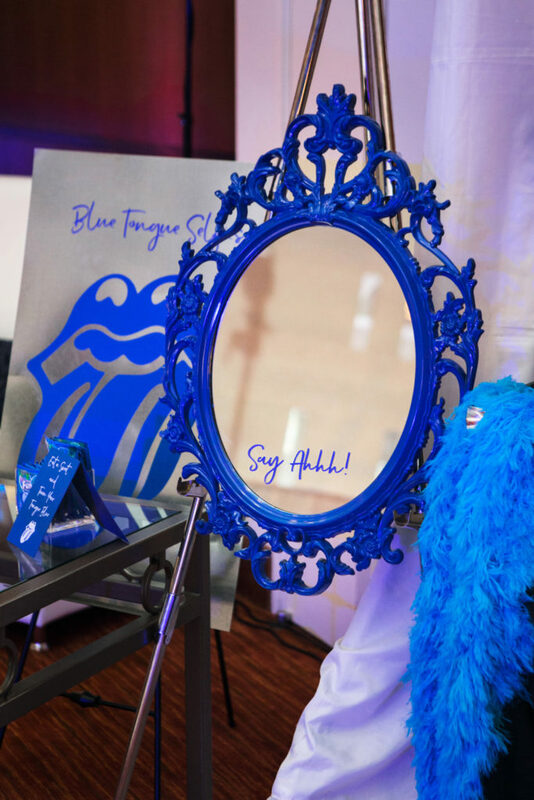 The House of BLUES Bar featured headlining martinis with BLUE cheese-stuffed olives. 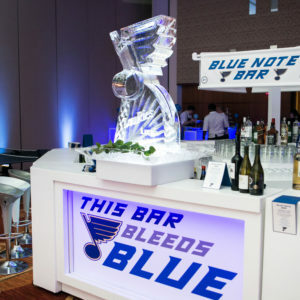 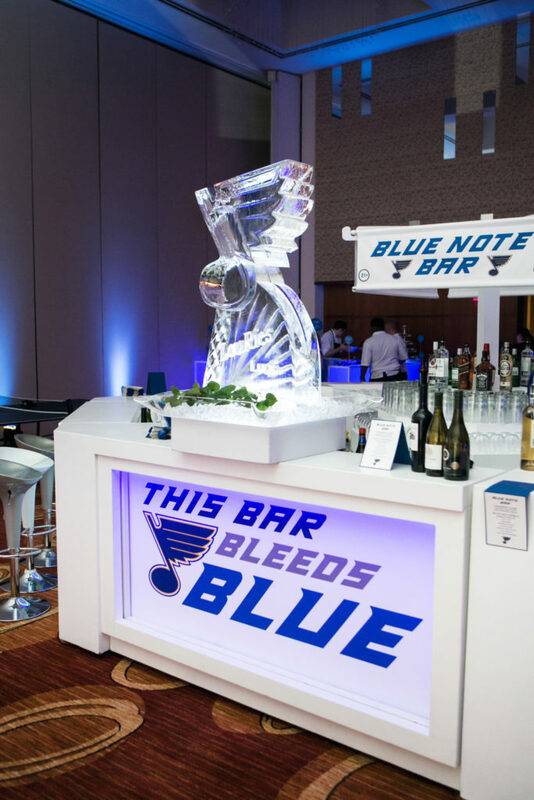 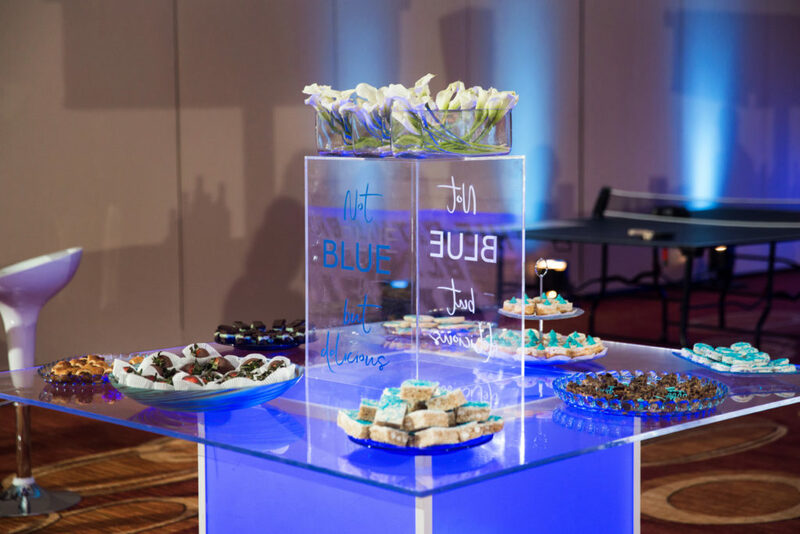 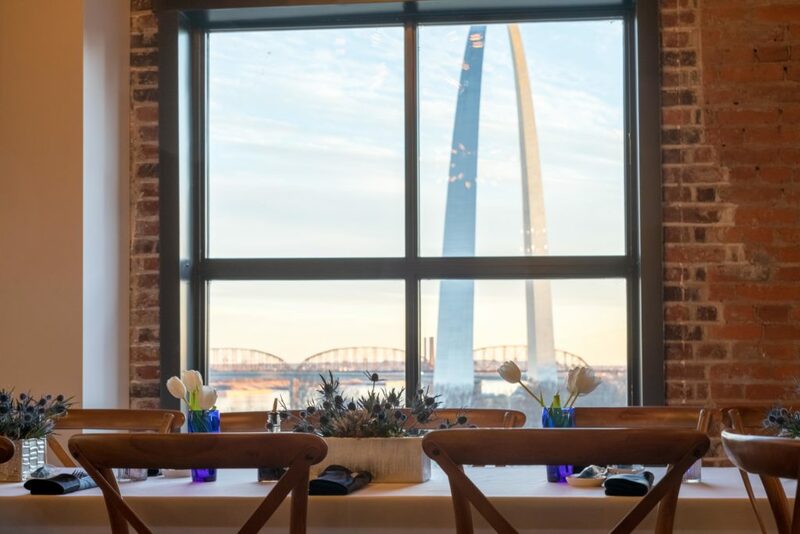 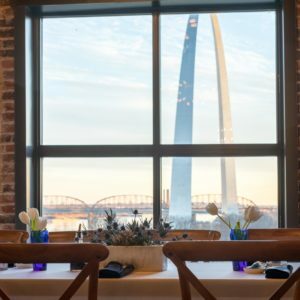 And for the fourth side, a BLUE-themed event wouldn’t be complete without a St. Louis BLUE Note Bar, including a LOUrIES Ice Luge. 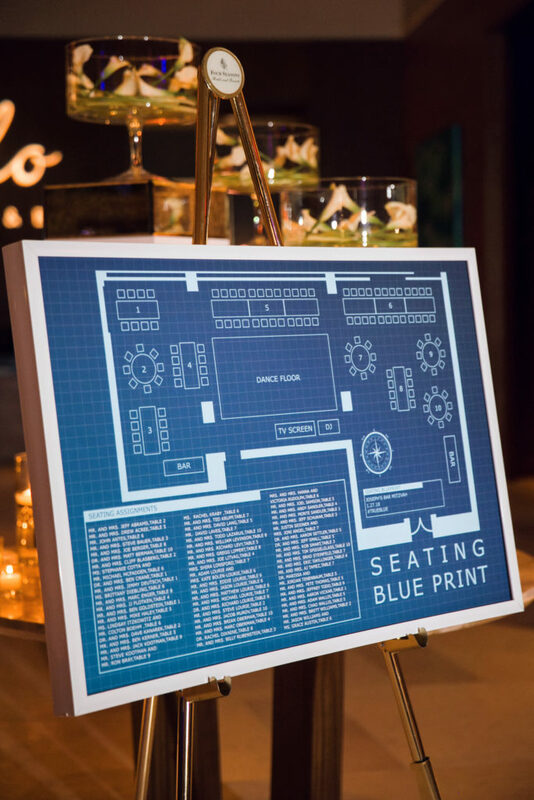 White lounge style seating throughout the space gave guests a break from the dance floor, with pictures of Joseph (printed with a BLUE tint) flanking the bookcases behind the lounge. 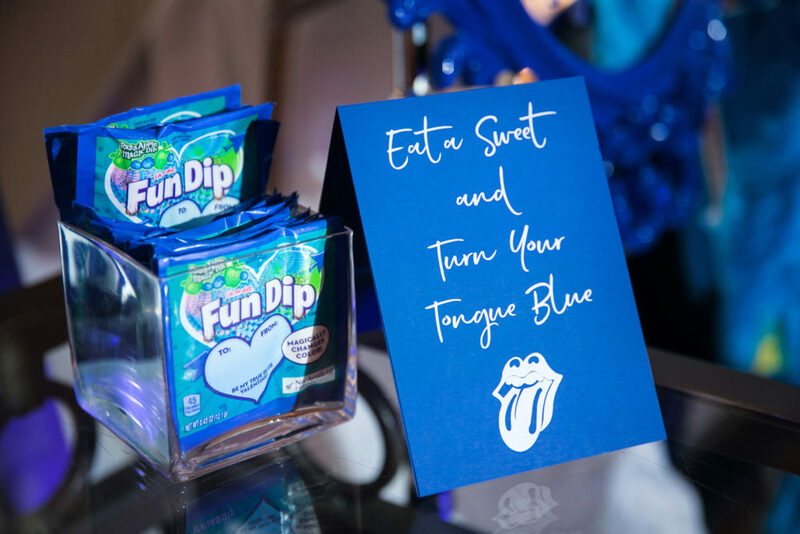 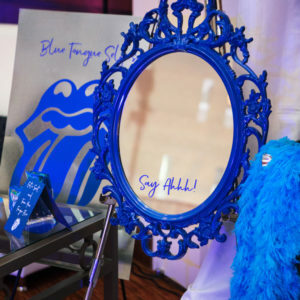 Guests could snap a picture at the Fish Eye Fun photo booth and, if they felt adventurous, they could make their tongue turn BLUE for a BLUE Tongue Selfie. 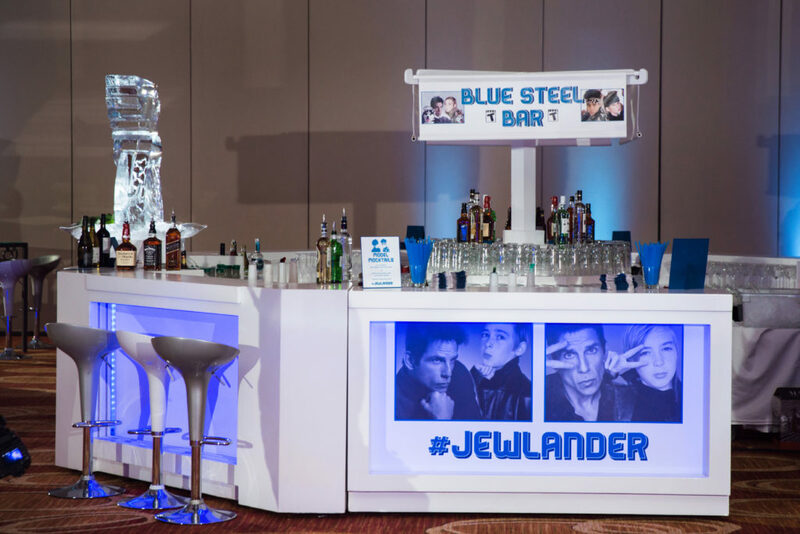 My favorite part: The bar façade of Derek Zoolander and Joseph striking their best BLUE Steel pose — #Jewlander. 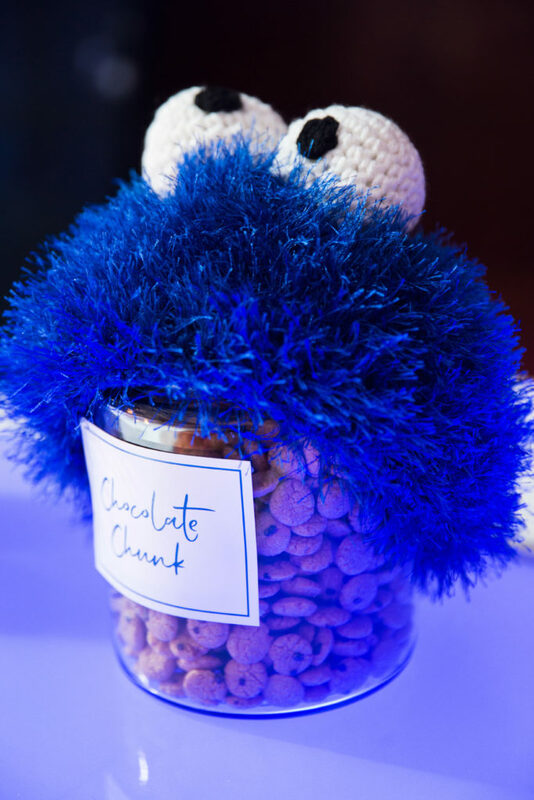 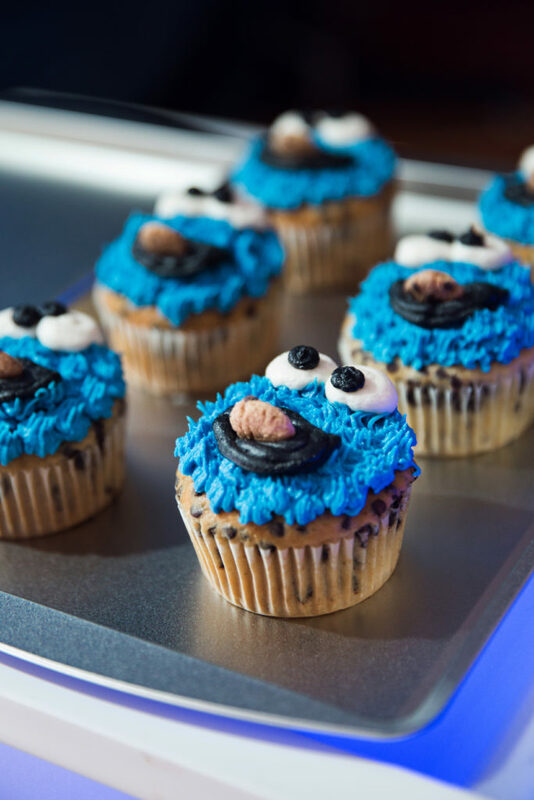 A Cookie Monster’s Corner featured warm Insomnia Cookies, Cookie Monster cupcakes (chocolate chip cake inside), and Dippin Dots (with Cookie Dough, Cookies and Cream and Chocolate Chip). 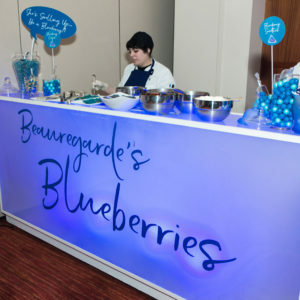 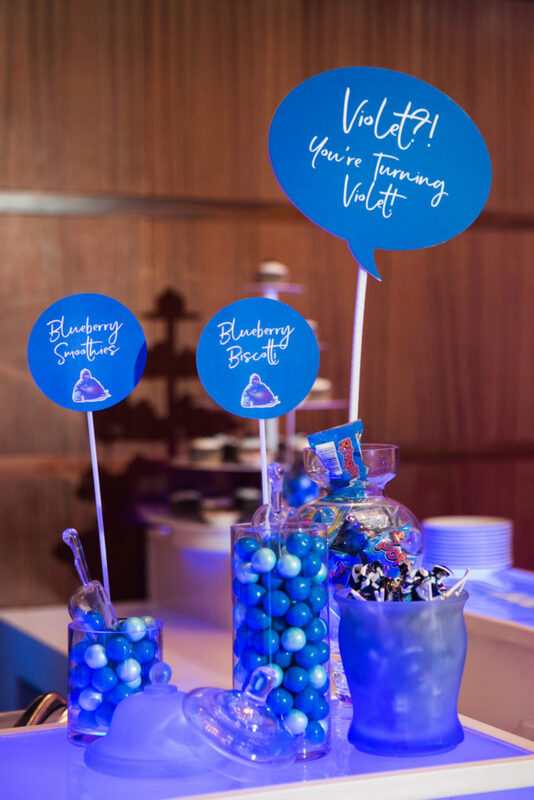 We had a Beaugurades BLUEberries Station, which was a tribute to Willy Wonka’s Violet turning Violet. 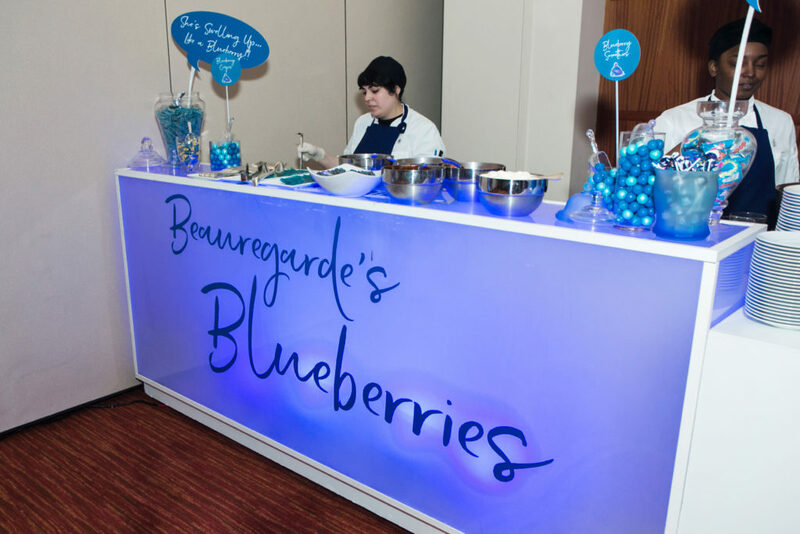 The desserts had a BLUEberry twist: made-to-order BLUEberry crepes and BLUEberry smoothies, mini BLUEberry pies, BLUEberry biscotti, and BLUEberry cupcakes. 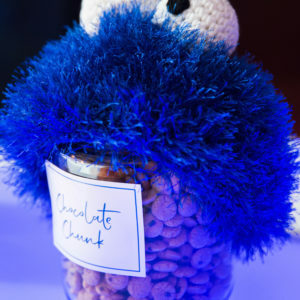 My favorite part: Theming of the Cookie Monster action station. 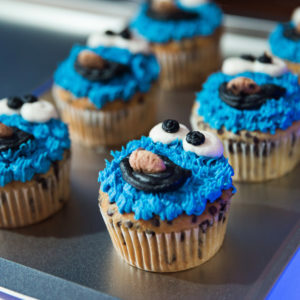 I mean, who doesn’t like a warm cookie right off a baking sheet? 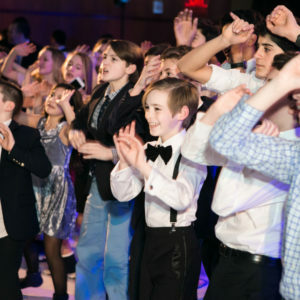 Back to the party. 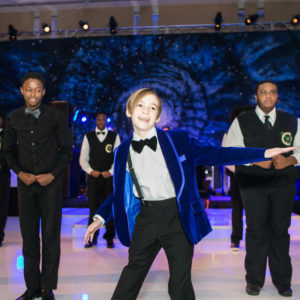 As guests made their way from the rock concert, they were greeted by the stepping sounds of a nationally recognized step group Gentlemen of Vision. 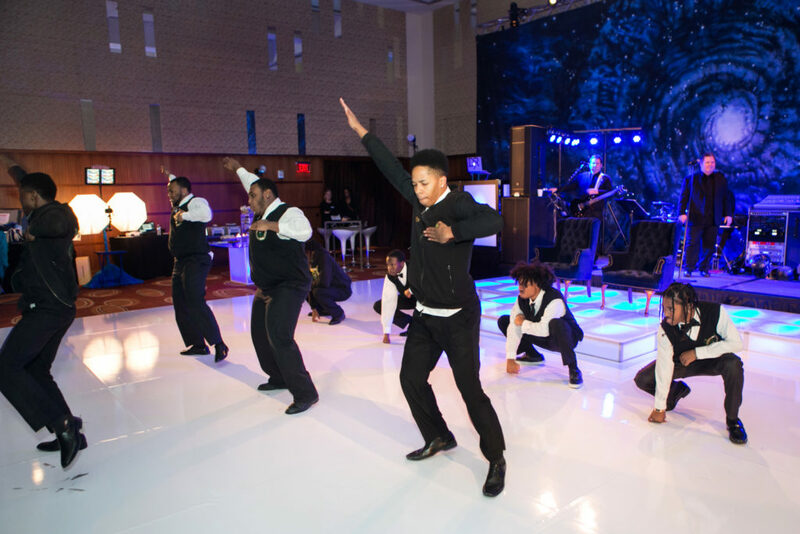 These talented high school students set the tone for the next phase of the night. 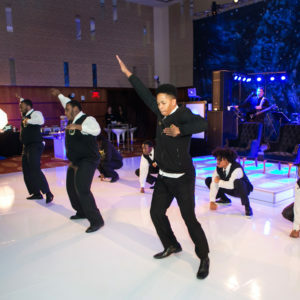 Joseph joined them as part of the routine, before they transitioned the performance and stepped underneath the opening part of Hava Negilia, as the band joined in. 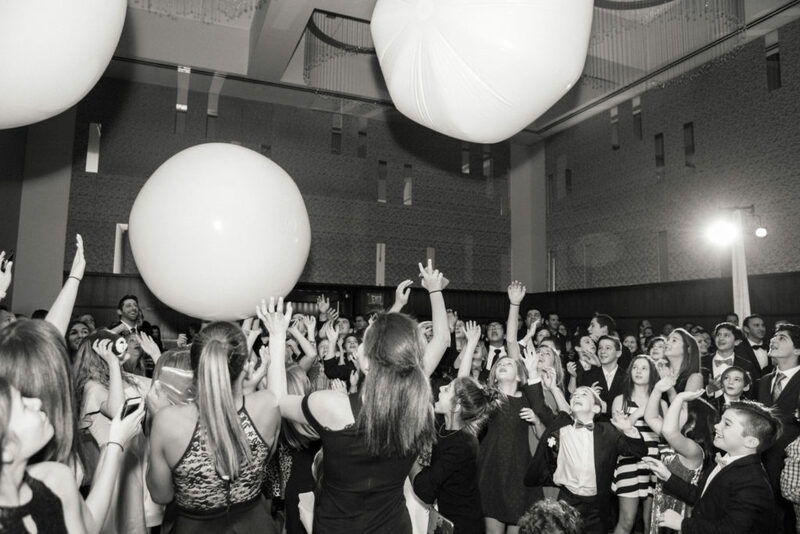 This momentum was in full swing and never let up. 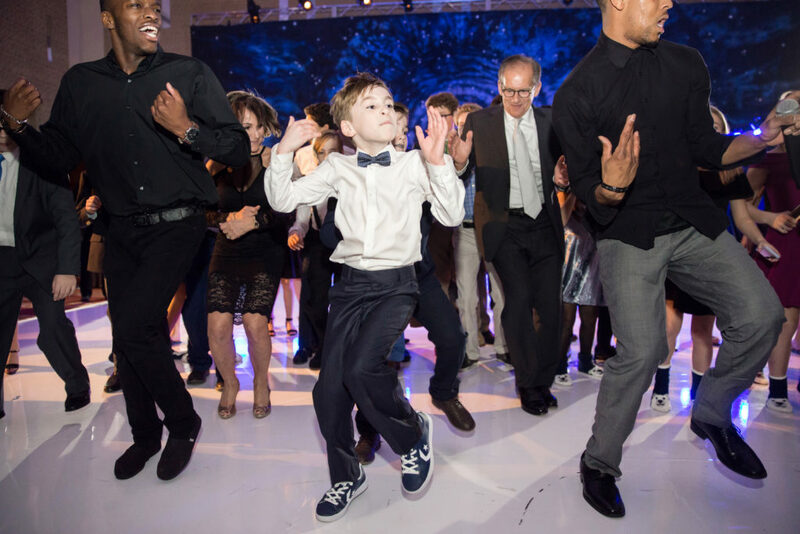 Thanks to the talent and energy of the band, Griffin and the Gargoyles, and the DJ and emcee from Utopia Entertainment, the dance floor was packed all night long. 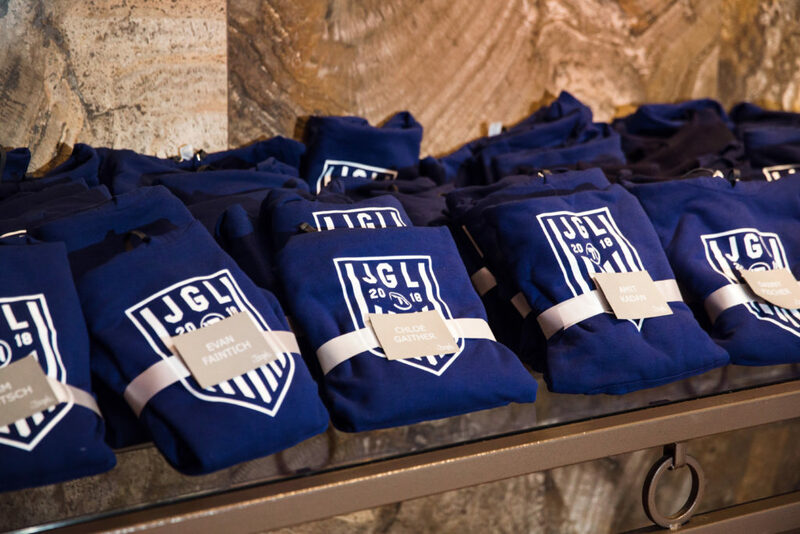 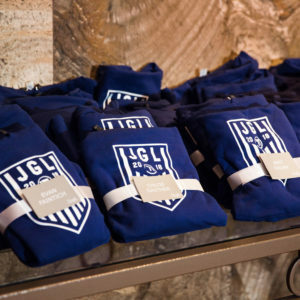 Teens took home BLUE hoodies with Joseph’s logo fashioned after the USA team’s soccer logo. 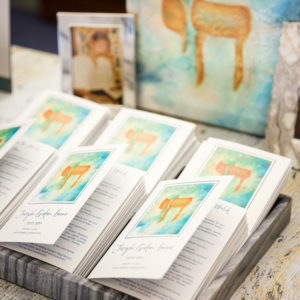 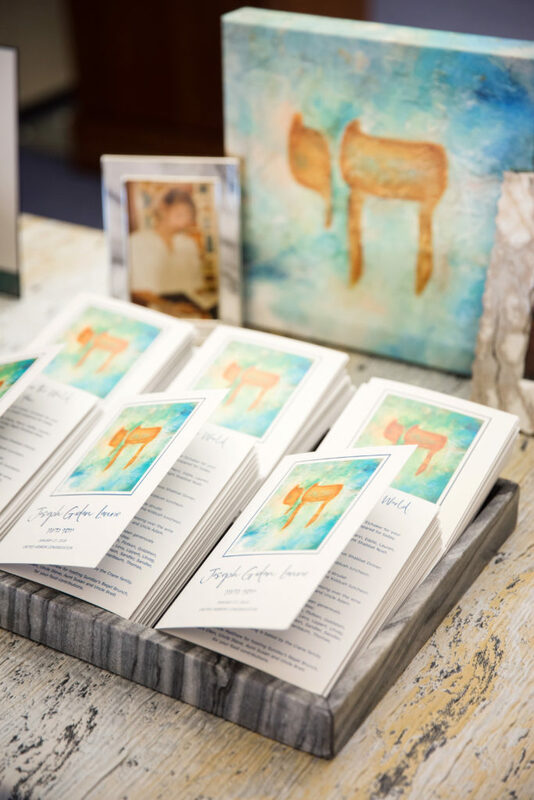 Adult guests walked away with BLUE “to go” Havdalah sets to help remember Joseph’s night. 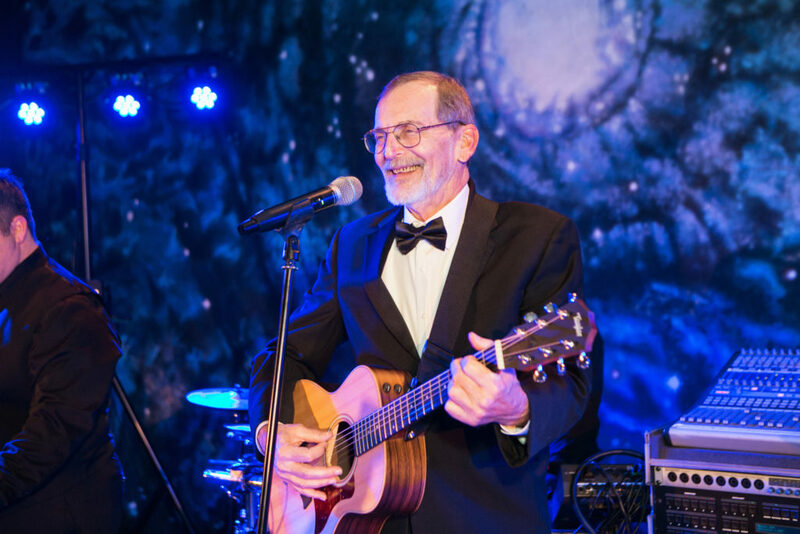 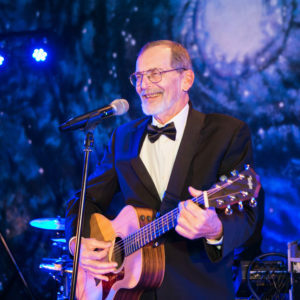 My favorite part: My father playing on guitar, playing and singing the lullaby he wrote for Joseph when he was just born entitled “Baby Joseph,” as I dance with Joseph for the mother and son dance. 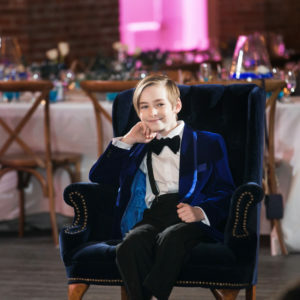 So, that’s it. 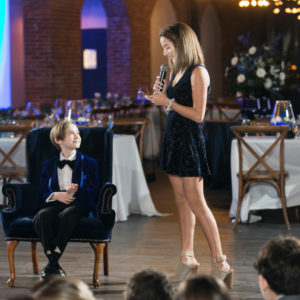 Even as a wrote the recap, I found myself enjoying memories of all the special, little touches. 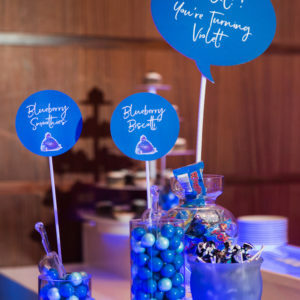 But it didn’t matter to me if guests noticed each of the many BLUE-themed elements. 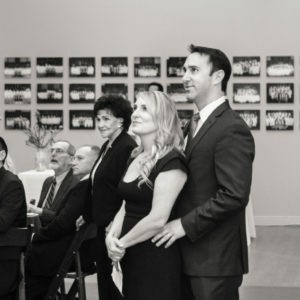 I most cared about their experience and hope they walked away with a memory of the love and energy they shared with our family on this very special day.